I don't have much experience with foals, having never raised one myself, but I got to help out with a newborn this morning. 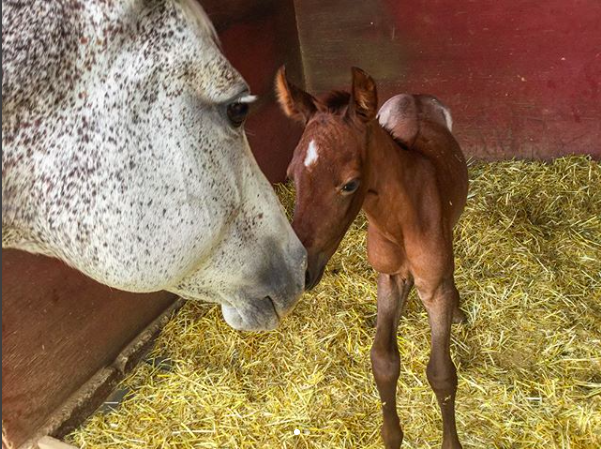 On Mother's Day Lena (gray dappled QH mare) had her baby! A little girl! 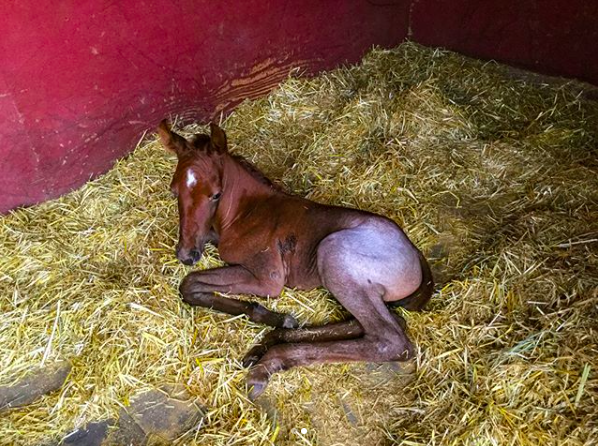 This filly is a red roan and the cutest thing ever! I got to help Debbie imprint the little foal this morning. Imprinting is basically introducing humans to the horse at a very young early on age. In fact as soon as their born! It's letting the horse know who you are and not to be afraid of you or your tools. Teaching respect should also be taught through the foal's life. Imprinting a horse so early in his/her life is so useful especially since it helps the foal get used to farriers, vets, riding and anything else the horse will encounter in the future. They're also easier to train because they've been introduced to humans and their tools. Imprinting is harder to do the older the foal is because he get's stronger and could hurt you easily. Imprinting a foal may look abusive to a lot of people, but it's not! Basically it's laying the foal down so he's on his side. keeping him there by holding on to his foreleg that's closest and hindleg that's closest. Also keeping the foal's head bent around to his withers. This keeps him in a bind so it's harder for him to get up or struggle loose. Imprinting has a lot to do with desensitizing. Clinton actually has videos and information on this too. There are a lot of different ways of doing it but when I've heard and got to do was basically rub/pat a spot on the foal about 50 times and if the foal reacts, start over again. So as you can see it takes a bit of time. And this has to be done all over the foal's body. Every horse has a spot where they loved to be touched or hate to be touched, or may not even care! Doing this all now is easier than trying to do it when it's grown. The bigger the horse the easier for him to hurt you. If we touch the foal 50 times in a spot and she doesn't react then we move on to another spot. We did it all over her body! And I mean all over, even in her nose and ears! Touching and tapping on her feet too, which prepares her for the farrier when she's big enough. The last thing we want to do is let her go when she reacts. It's desensitizing, so if she relaxes we can move on. If she reacts we have to stay there until she relaxes again. Imprinting is done about 3 times. This morning was her last imprinting and she did great! She had a better side. SO many horses have a good side and a bad side in almost any situation. The goal is to always even them out.